VIVOSUN Digital pH Meter Tester Pen helps to measure acidity or alkalinity easily and accurately. 1. Don't touch the electrode by hard tools or fingers. Always replace the protective cap to keep electrode from drying out. 2. Clean the electrode every time before and after using. 3. When the meter cannot be turned on or the display fades, open the battery case and replace battery (pay attention to the polarity), then need to recalibrate the meter. Ideal for residential or commercial use, water, pool, spas, liquid food, laboratory, aquaculture and hydroponics. Advanced technology makes the test result fast and accurate.Easy calibration (pH4.00, pH6.86). Pocket size, lightweight, high quality. With Automatic Temperature Compensation (ATC). 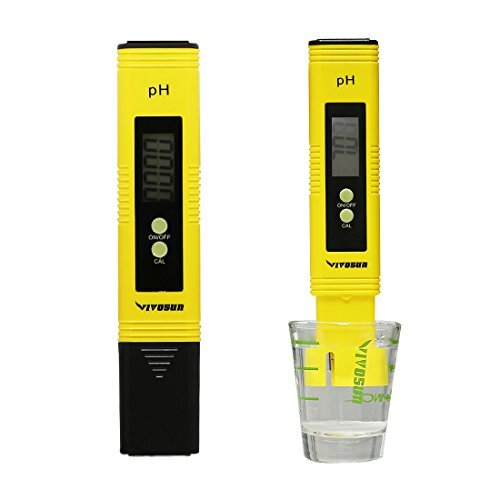 Adjust to water temperature and give pH reading almost instantly. What You Get: VIVOSUN pH meter, user manual, 2 x 1.5V button cells (built in), 3 x pH buffer powders, 1-year warranty and friendly customer service.